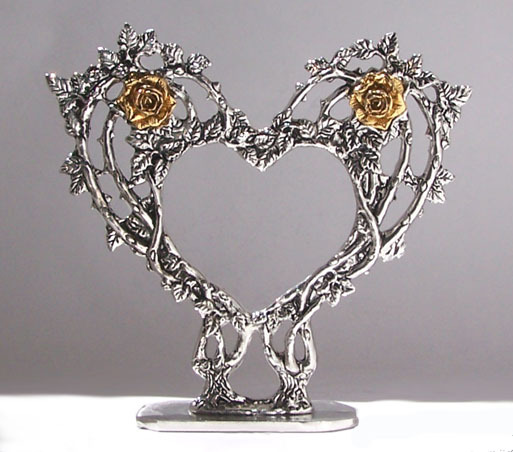 Full of leaves and thorns, these two beautifully detailed rose vines have grown into the shape of a heart. The roses that bloom are pewter dipped in 23k gold. We designed it orginally as a wedding-cake topper, but it is a lovely sculpture on its own. We make this lacy-looking Pewter Cake Top by hand from lead-free pewter. It's 6 1/2 inches at the widest, and the base is 3 1/4 by 1 3/4 inches.